The 35mm upside down front forks by WP Suspension with 215mm of travel ensure the most sensitive response. They are perfectly matched with the high-end WP PDS monoshock and guarantee optimum damping characteristics and outstanding stability. The rear wheel travel is 270mm. With adjustable compression and rebound stages, the suspension can be set up precisely for the rider and track in no time. Like the big KTM factory racers, the 65 SX has super lightweight, black anodized, aluminum rims providing highest strength and safety. Knobby MAXXIS tires grip superbly on any surface. The 65 SX is fitted front and rear with massive four-piston calipers that grip lightweight Wave brake discs of 198mm front and 160mm rear diameter. The hydraulic brake system is easy to control and ensures the best braking and the highest standard when it comes to safety. The new 65 SX is fitted with a newly designed cast aluminum swingarm. Conceived using the latest in calculation and simulation software, the design and wall thickness have been optimized for minimum weight at optimum stiffness and precisely defined flexibility. Not only that, the 2016 bike features a new 2-compound chain guide similar to the full-size models, a new chain glider, and a redesigned rear axle with new chain tensioners. 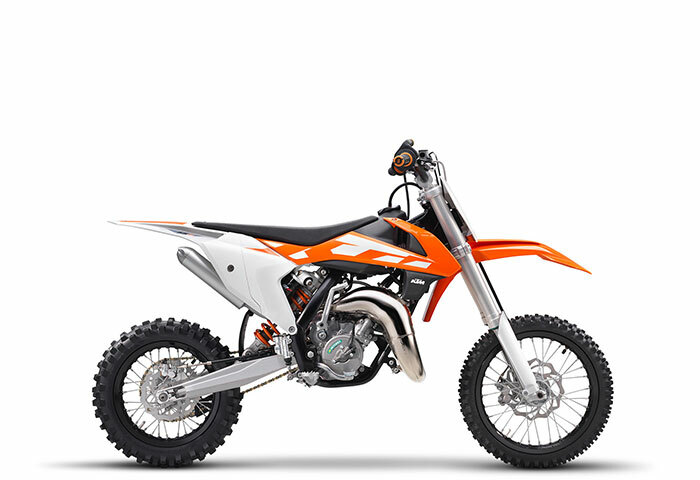 The 65 SX benefits from cutting-edge 2-stroke technology and an easy to shift 6-speed transmission with a hydraulic clutch. The pressure controlled exhaust valve provides, in conjunction with a new exhaust pipe and silencer, even more power and plenty of torque. A reworked kickstarter makes starting even easier than before. 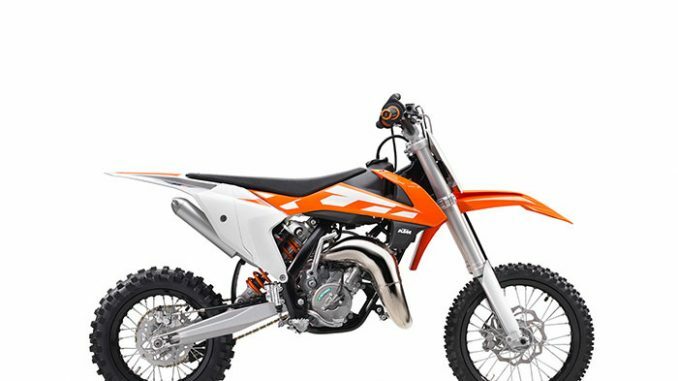 The high performance cylinder features the pressure controlled exhaust valve (PCEV) and provides an unrivalled performance within the highly competitive 65 cc class. An outstanding feature of the 65 SX is the hydraulic clutch made by Formula. It ensures an easy clutch action and excellent modulation. For 2016 the engineers designed all new plastics that provide perfect ergonomics and contact points for the rider, maximum freedom of movement and better seat comfort. In addition, advanced design solutions for the new front and rear fenders are prime examples of an intelligent design, which guarantees maximum stability through a well thought-out structure and mounting. The modern frame produced by WP Performance Systems is made of lightweight, high strength chromoly steel profiles and combines maximum longitudinal stiffness with optimum torsional rigidity. It guarantees easy handling and precise cornering, but also outstanding stability. The lightweight aluminum subframe is adapted to match the new bodywork. An intelligent cooling circuit with integrated crankcase cooling and two redesigned radiators improves the heat dissipation and ensures a constant temperature balance for consistent, high performance. New, classy anodized handlebars made of a high quality aluminum alloy are distinguished by the best ergonomics and the highest strength. A new crash pad on the handlebar brace protects the rider from impacts. Derived from the full-size SX bikes, the in-mold graphics make the new 65 SX even cooler. Its frame has a super rugged polymer coating in noble black.